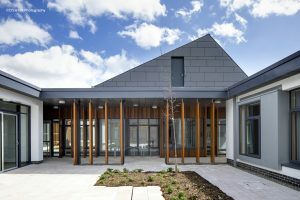 TODD Architects carefully designed Rathview Mental Health Facility in Omagh for Western Health and Social Care Trust breaks down preconceived ideas of mental health facilities. 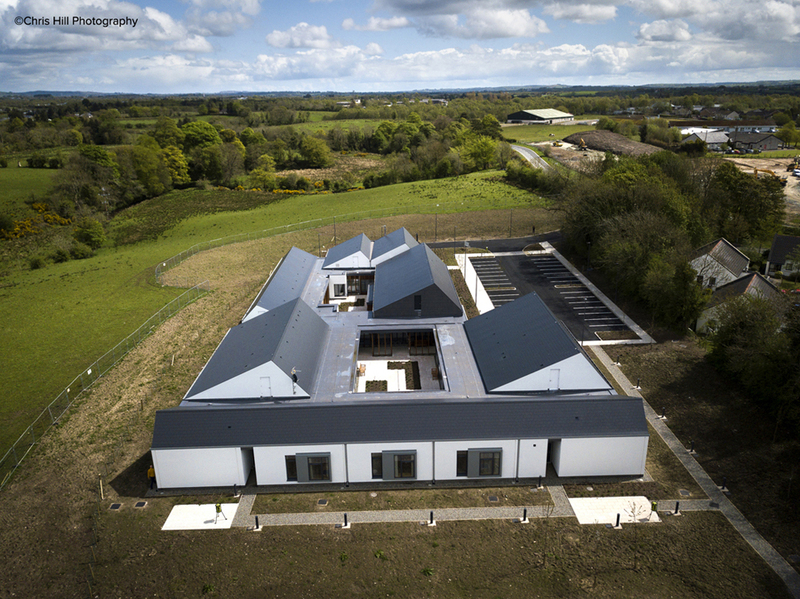 At first glance the c£2.8m Rathview Mental Health Facility (aerial view above), Omagh, is not what you would expect. In fact, it would be hard to know it was a healthcare building at all. And that’s the point. Its height, whitewashed walls, slate clad appearance and rural setting all combine to lend it a ‘homely’ domestic feel. Completed in April 2018 for the Western Health and Social Care Trust, TODD Architects carefully designed Rathview to break down traditional, preconceived ideas of mental health facilities, offering a fresh, residential approach in a peaceful countryside setting. Situated a rural greenfield site on the outskirts of Omagh, the new £2.8m, 1,169m² facility contains a twelve-bed Discharge Unit and a six-bed Recovery Unit, arranged around two central courtyards. With its innovative design, the unit will increase the range of community-based mental health services, helping those with complex mental health problems on their path to recovery and independence. Aerial view of Rathview Mental Health Facility. The medium-stay Discharge Unit focuses on rebuilding residents’ confidence and independence by providing a domestic environment, with autonomous access to their accommodation. Twelve individual, one-person apartments are laid out around a central courtyard with two activity social spaces and a training kitchen. The six-bed Recovery Unit offers short-term care for clients, and the en-suite rooms are specifically designed to balance resident privacy with essential observation and access. Sensitively arranged around a fully enclosed courtyard, the unit includes staff accommodation and communal areas, including a social living room, a TV room, treatment rooms and an ADL room.